Audience Award for Best Documentary - San Francisco Film International Film Festival; Audience Award for Best Documentary - Rencontres Film Festival Montreal; Spirit of Freedom Award - Bahamas Film Festival; Best Musical Score Award - Bend Film Festival. Film featured as part of A Very Special Benefit - an arts program to raise funds for Darfur. 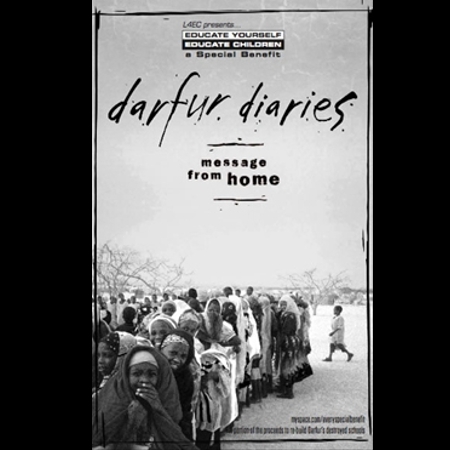 Darfur Diaries provides a platform for the people of Darfur (both those displaced inside Darfur and those living in refugee camps in Chad) to speak for themselves about their experiences, their fears, and their hopes for the future. The conflict serves as the ongoing narrative in the film, but the focus is on the people who are living through what has been termed a genocide. Through the voices of refugees, displaced persons, and in particular women and children, this film seeks to provide space for the marginalized victims of the atrocities to speak out and engage with the world. Additionally, the film probes the history, culture and heritage of Darfur to deepen understanding of the crisis.